A stunning collection of centuries-old theatrical masks that is believed to have vanished from the famed Horyuji temple in Japan over a century ago have been located in a museum in Germany. Two of the 11 wooden masks discovered likely date as far back as the seventh century in the Asuka Period (592-710) and were discovered by researchers at Hosei University in Tokyo. They were found at the State Museum of Ethnology in Munich. The artifacts were apparently removed from the Horyuji temple in Nara Prefecture, a World Heritage Site that is the repository of many of Japan's national treasures, in the first years of the Meiji Era (1868-1912). At the time, the nation was rushing to modernize after more than two centuries of self-imposed isolation. Horyuji was founded in the early seventh century and rebuilt through the early eighth century after it burned down. It is acknowledged as the world's oldest wooden building. Masashi Oguchi, a professor of Japanese ancient history at Hosei University, called the discovery historically significant. The masks are believed to have disappeared during a period of great turmoil in Japan. The feudal era had just ended with the restoration of imperial rule. In one of its first acts, the Meiji government issued a decree to separate Buddhism and Shinto to rebuild the country centered around the emperor, Shinto's chief priest. 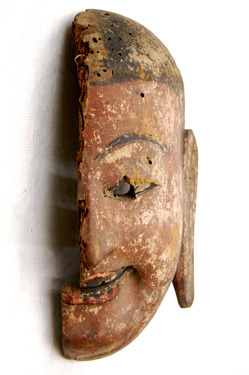 Many Buddhist structures as well as images and statues were destroyed as a backlash took hold. "Because of the anti-Buddhist movement, the Horyuji temple had to relinquish many items in its possession," Oguchi said. "Fortunately, they were preserved in Europe. The masks are essentially witnesses of history." Josef Kreiner, who led the team at the university that studied Japan's Buddhist art in Europe, identified the 11 items--all partially damaged--at the museum's treasure house in February. Museum records show that the masks were formerly in the possession of Ernst Grosse, a German ethnologist, and joined the museum's collection in 1928. The masks were used in ancient pantomime or during performances of traditional Japanese court dances accompanied by music. The two masks were carved from camphor tree, as were many other existing masks from the temple, according to Yuta Jinno, a guest researcher at the university who analyzed them. Jinno said the shape of the masks, along with the way they were carved, are strikingly similar to those artifacts from the temple. According to historians, the camphor tree was favored by sculptors before the Nara Period (710-784) for creating Buddhist statues and altar fittings. Six masks bear a kanji inscription on their backs that say they were created for Horyuji pantomime. It emerged that the inscriptions were made by sculptor Tessai Kano (1845-1925), who did a lot of research into Japan’s cultural past with Tenshin Okakura (1863-1913), a revered art critic and philosopher in the Meiji Era. The university team concluded the two masks made of camphor were almost certainly created during the Asuka Period, which prospered in what is now part of Nara Prefecture, and that they likely belonged to the Horyuji temple in Ikaruga in the prefecture. 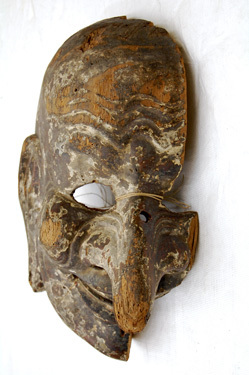 Thirty-two pantomime performers' masks originating from the temple are known to exist in Japan. They are all designated important cultural properties. Details of the discovery will be discussed at an international symposium, titled "Japanese Buddhist Objects in European Collections and Their Impact on the European Image of Japan," at Hosei University on Nov. 17.